The Heisman Trophy will be presented this evening at the Grand Ballroom in the Hilton New York. “The Heisman”, as it is known, is named after former college football player, coach and innovator John Heisman, and is awarded annually to the most outstanding collegiate football player in the U.S.
…depicting a sidestepping, and straight arming football player making his way downfield to a mythical touchdown! The idea of an award to honor and recognize the most outstanding college football player was originally conceived by members of the Downtown Athletic Club of New York City. Renowned for its devotion to sports, members of the Downtown Athletic Club, appointed a Club Trophy Committee, led by John W. Heisman who was the first Athletic Director of the Downtown Athletic Club, and charged them with conducting the first award presentation at the conclusion of the 1935 football season. The trophy committee of the DAC after considering a traditional cup or bowl, selected a well-known sculptor and National Academy Prize Winner, Frank Eliscu, to design a replica in bronze of a muscular football player driving for yardage. Mr. Eliscu selected Ed Smith, a leading player on the 1934 New York University football team, as his model for the award. A rough clay model was formed by Eliscu of Smith. It was approved by the DAC Committee and sent uptown to Jim Crowley (one of the legendary Four Horseman of Notre Dame), then Head Football Coach at Fordham, for his inspection. He showed the replica to his players who took various positions on the field to illustrate and verify the side step, the forward drive and the strong arm thrust of the right arm. Sculptor Eliscu closely observed these action sequences and modified his clay prototype to correspond. The result was a truly lifelike simulation of player action. It was then converted into a plaster cast, a step preliminary to ultimate production in bronze. The final inspection of the cast was made after a dinner at the McAlpin Hotel on November 16, 1935, attended by Coach Elmer Layden and the entire Notre Dame football team (they had just played a memorable 6-6 tie with Army before 78,114 fans). The members of the Fighting Irish squad were impressed by Eliscu’s model. The 1935 Notre Dame team put its seal of approval on this new trophy. It was now ready for its final stage, bronze casting. The trophy was a classic sculpture, an artistic as well as athletic triumph. The first award of the “DAC Trophy” was made on December 9, 1935 to Jay Berwanger, a triple threat cyclone in Chicago’s backfield. It was not named the Heisman till the following year. Jay Berwanger, was drafted by the Philadelphia Eagles but declined to sign for them. He never played professional football for any team. Following John W. Heisman’s death in 1936, the DAC Trophy was renamed the Heisman Memorial Trophy as a tribute to the memory of the distinguished American athlete and inventive football genius. 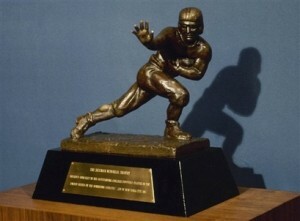 In 1968, the Heisman Trophy Committee voted to award two trophies each year – one to the winner and one to the college or university he represents. As the tradition of the Heisman Memorial Trophy grows with each passing year, the life of the man memorialized by the award fades into the annals of history. No one more thoroughly studied the dynamics of football, nor witnessed more closely the game’s evolution, nor personally knew more immortals of the gridiron, nor effected more change in the game’s development, the awards namesake -John W. Heisman. Born in Cleveland, Ohio, October 23, 1869, John William Heisman grew up on the oil fields of northwest Pennsylvania, in the town of Titusville. 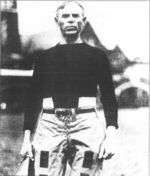 John Heisman’s first football games were a hodgepodge of soccer/rugby. In 1887, at age 17, he left Titusville for Brown University where he played a form of club football with his class mates. After two years, in the fall of 1889, he transferred to Penn to pursue his law degree. Though outsized at 5’8″ and 158lbs, he played varsity football for three years as guard, center, tackle, and, at times, end. Debilitated after a flash of lightening nearly cost him his eyesight, Heisman took his final exams orally and graduated with his law degree in the spring of 1892. Immediately after college, he got his first coaching job at Oberlin College leading the team to win all of its seven games in only the second year of the football program. Heisman’s career as a coach was launched. His career developed as Coach with stints at Auburn, Clemson, University of Pennsylvania, Washington and Jefferson and Rice. His coaching career ultimately spanned more than three decades (1892-1927). His most impressive coaching reign was with Georgia Tech (1904-1919) where his Golden Tornado was a scoring powerhouse with an astounding 33 straight wins. Coach Heisman left Georgia Tech after the 1919 season to return as head coach at his alma mater U. of Penn. After three years he bought out his contract and spent one year at Washington & Jefferson, before moving west to Texas and Rice Institute. In 1927, at age 62, John W. Heisman retired from coaching the game he loved and developed. In retirement in New York, John Heisman found more time to write as well as serve in advisory positions. His articles were published in magazines such as American Liberty and Colliers Magazine. He also served as football editor for the professional publication Sporting Goods Journal. This prodigious outpouring did not go unnoticed. On May 23, 1930, John W. Heisman was named the first Athletic Director of the Downtown Athletic Club of New York City. Serving in this capacity, Heisman organized and founded the Touchdown Club of New York, and later the National Football Coaches Association. At the insistence of the DAC officers he organized and set into motion the structure and voting system to determine the best collegiate football player in the country. Though Heisman initially opposed pointing out an individual over a team, he ultimately felt it a consummate team accomplishment to have such recognition. In doing so the first Downtown Athletic Club Award was given in 1935 to Chicago’s Jay Berwanger. On October 3, 1936, before the second award could go out, John W. Heisman succumbed to pneumonia. The officers of the DAC unanimously voted to rename the DAC Award, the Heisman Memorial Trophy that year. In his coaching career, Heisman changed the face of the game that became America’s passion. What he considered his greatest contribution, the forward pass, became legalized in 1906, after three years of writing and pestering Walter Camp and the rules committee. Much of the official rule book in the day adopted Heisman’s suggestions word for word. Men who respected and called him friend included: coaches Robert C Zuppke of Illinois, Fielding Yost of Michigan, Amos A Stagg of Chicago, Dr. J. W. Wilce of the Ohio State University, D.X. Bible of Texas A&M, legendary sports writer Grantland Rice, golf’s first Grand Slam winner Robert Jones Jr. and former team mate and Honorable Mayor of Philadelphia Harry A Mackey. As did his life touch many, the spirit of his character continues to inspire the best in those who would receive his Memorial. The prestige in the award stems from a number of factors. Though balloting is open for all football players in all divisions of college football, the winners usually represent Division I FCS schools. The closest that a player outside of the modern Division I FCS came to winning the Heisman is third place. Steve McNair, from Division I FBS Alcorn State, finished third in the voting in 1994. Gordie Lockbaum, from Division I FBS Holy Cross, finished third in the voting in 1987. Archie Griffin of Ohio State is the only player to receive the award twice, winning it as a junior in 1974 and a senior in 1975. (Although Chicago is now a Division III school and Yale and Princeton are now Division I FBS, all three schools were considered major programs at the time their players won the award.) In addition to incredible personal statistics, team achievements play a heavy role in the voting—a typical Heisman winner represents a team that had an outstanding season and was most likely in contention for the national championship at some point in that season. Balloting for the Heisman is selective. The fifty states of the U.S. are split into six regions, and six regional representatives are selected to appoint voters in their states (the regions include the Far West, the Mid Atlantic, Mid West, North East, South, and South West). Each region has 145 media votes, for a total of 870 votes. In addition, all previous Heisman winners may vote, and one final vote is counted through public balloting. The Heisman ballots contain a 3-2-1 point system, in which each ballot ranks the voter’s top three players and awards them three points for a first-place vote, two points for a second-place vote, and one point for a third-place vote. The points are tabulated, and the player with the highest total of points across all ballots wins the Heisman Trophy. Special thanks and acknowledgement for the material contained in this blog to the book, Call Me Coach; www.Wikopedia.com and www.Heisman.com. This entry was posted in Uncategorized on December 8, 2007 by admin.